This Dirt Pudding Recipe has been a family favorite for decades! Although I first started making it when the kids were little, to this day, this is the one dessert recipe that they request every year on their birthday! 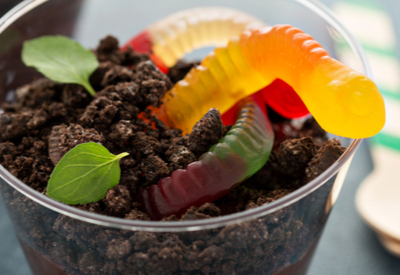 Although not necessary, gummy worms add a cute touch to this dirt pudding recipe. Not a single request to blow out candles on a traditional birthday cake or to eat an entire tray of our Famous Fudge Brownies. Not even a promise to purchase a gallon of their favorite ice cream can top the request for Dirt Pudding in our house. You may wonder why anyone would want to eat Dirt Pudding. The name itself doesn’t sound so appetizing. However, when you look at the ingredients and end result, this is not only a delicious dessert, but a fun one as well! 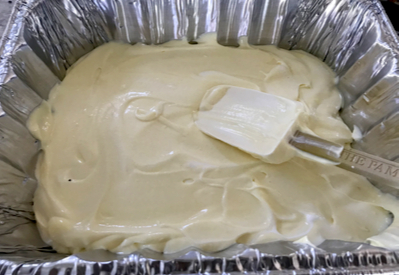 This time I used French Vanilla pudding instead of Chocolate – my personal favorite. Think of eating dirt. You would dig your hand into a pile of dark crumbled soil, not really knowing what you might sink your teeth into. Who knows, there could be a worm or two in that scoop! What else is hiding underneath? But don’t worry. No one here is actually going to make you eat dirt. The dirt in this recipe is made from crushed Oreo cookies. Now doesn’t that sound much more appetizing than eating real dirt? 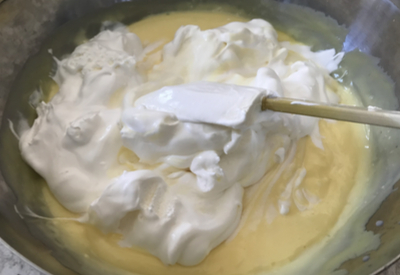 Folding the Cool Whip into the pudding mixture makes this filling light and fluffy. And below the dirt layer is a delicious bed of pudding sweetened with powdered sugar, cream cheese and Cool Whip! The pudding is light and airy and is the perfect complement to the crunchy bits of Oreo dirt. 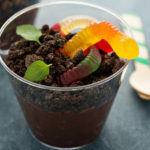 And of course, you can hide gummy worms in the Dirt Pudding to make it even more fun, especially if you are serving it to a younger crowd. 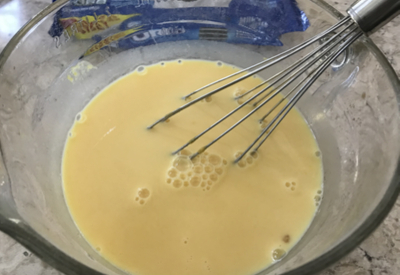 After the first layer of Oreos is on the bottom of the tray, spread the pudding mixture on top. This recipe calls for using an 8 x 8 serving dish or a large bottom bowl for serving. This works perfectly when you are making this for a family or pot luck dessert. However, if you are making this for a group of children for a class party or birthday party, you can get creative. Try making them in individual serving portions using terracotta pots as the dish. Add a cut straw in the middle of the pudding. Then place an artificial flower in the straw. Now it looks like they are actually eating dirt from a potted plant. How Fun! 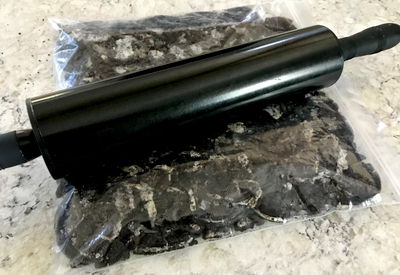 An easy way to crush Oreo cookies – place them in a large zip-lock bag and use a rolling pin to crush them into tiny pieces. Just be sure that the pot is new and if it has a hole in the bottom, place a small round disk of parchment paper in the bottom of each pot. But this recipe isn’t just for kids! We served this dessert at a Spring garden conference and everyone loved it! 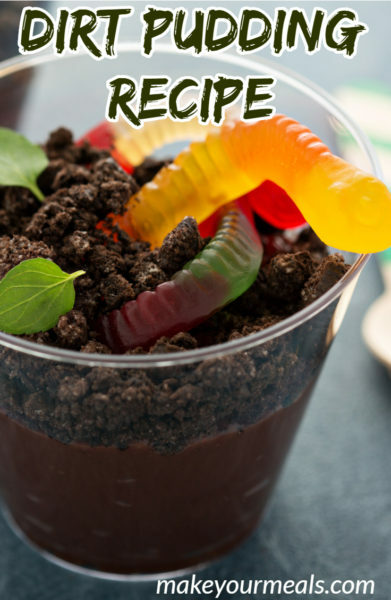 A fun and delicious dessert that consists of a sweet pudding mixture topped with crushed Oreos and gummy worms to make it look like you are eating dirt. In a gallon zip-lock plastic bag, crush one whole package of Oreo cookies into small crumbs. In a mixing bowl or in a food processor cream together butter, cream cheese and powdered sugar. In separate bowl, mix together milk and pudding mix. Add the pudding to the creamed mixture and stir until incorporated. Fold in Cool Whip until incorporate. Place a thin layer of the crushed Oreos in the bottom of an 8x8 dish or large bottomed bowl. Put the pudding mixture on top of the crushed Oreos and spread evenly in the dish. Place the remaining crushed Oreos on top of the pudding to represent dirt. Refrigerate for at least 1 hour prior to eating. You could use vanilla Oreo and vanilla pudding and call it sand pudding! Stick the gummy worms into the pudding so it looks like the worms are coming out of the dirt. Cover and refrigerate until chilled. NOTE: If you want to add more gummy worms, you could layer a few in the pudding as you are pouring it into the bucket.